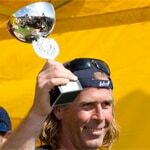 Jimmy Lewis Europe is very pleased to welcome Welsh Surf Legend Chris ‘Guts’ Griffiths to the team. Guts said ‘I’ve been into SUP for about a year now, and am enjoying it more than I ever thought I would. Most people think that it will impact on your surfing sessions but I find I am spending more time in the water these days than ever, which means I am fitter and surfing better too. It’s also been great to find a range of boards which allow me get the most out of every SUP session no matter what the conditions. Even my 13 year old son Connor has found a model he loves to ride too.” (Connor just took out the under 18’s category at the last BSUPA contest). Chris ‘Guts’ Griffiths SUPing on his Jimmy Lewis board. Having won the wave event at the second BSUPA 2008 competition (round one didn’t run due to lack of waves) Guts is confident in continued competitive success this year. He is also looking forward making an impression in the larger UK surf once it starts to arrive later this year.